TIANJIN, China – Though Chinese workers this week celebrated the 61st anniversary of the founding of the Peoples Republic of China, a holiday season as significant as July 4 in the United States, a swarm of construction laborers at China’s GreenGen coal-fired gasification power plant were busy welding pipes, fitting massive joints, and bending steel for forms to be filled with concrete. 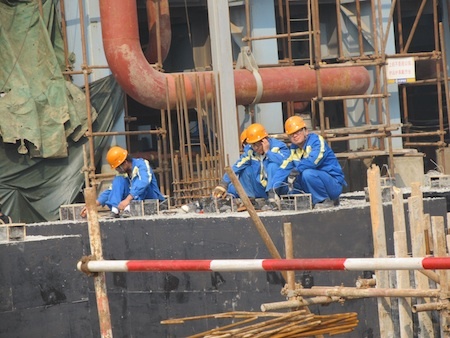 Since construction on the $1 billion project began in June 2009, said Li Liangshi, the deputy chief engineer, the dusty construction site has been a nonstop 24/7 hive of activity for 2,100 workers. Next year, the consortium of companies financing the project, five of them Chinese plus Peabody Coal, an American producer, plan to start operations. GreenGen’s principle purpose is demonstrating advanced Chinese technology to burn coal much more efficiently than conventional power plants, remove many troubling air pollutants, and prove that its climate-changing carbon emissions can be safely captured. Much of the sequestered carbon will be pumped into oil wells to increase production in one of the China’s mature oil fields. This week the UN climate negotiations inside the expansive Meijiang Convention and Exhibition Center here have been stymied, in large part by a dispute between China and the United States about how the two countries take action to combat climate change and measure progress toward those ends. Outside the closed negotiating sessions, though, a series of side events convened by NGOs and governments have detailed the progress, some of it quite impressive, that both countries are making to advance clean technology and energy efficiency that are intended to simultaneously build economic vibrancy while lowering carbon emissions. In some cases, Chinese and American companies are cooperating on clean energy and efficiency projects. GreenGen will test gasification technology developed by China’s Thermal Power Research Institute (TPRI). TPRI has licensed the gasification technology deployed at GreenGen to Houston-based Future Fuels LLC. Future Fuels plans to use the technology at its Good Spring IGCC project in Pennsylvania, which it expects will deliver 270-megawatts of electricity while capturing over 50 percent of the CO2 output initially and nearly 100 percent by 2020. Coal’s influence in both countries on climate change is significant. The U.S. Environmental Protection Agency reported last year that coal combustion at American utilities accounts for 2.7 billion tons of the roughly 6 billion tons of annual U.S. carbon emissions. In rapidly developing China, coal accounts for 80 percent of the 6.3 billion tons of carbon emissions, or about a quarter of all the climate-changing emissions globally. Both governments, along with utilities and manufacturers see the need to reduce coal’s influence on global warming, and an opportunity to build economic strength in reaching that goal. Last November, during a trip to China, President Obama and Chinese President Hu Jintao formally announced the establishment of a joint Clean Energy Research Center to collaborate on the science and development of low-carbon energy, and to cooperate specifically on generating energy from coal with much less pollution. In March, Steven Chu, the American secretary of energy, announced that over the next five years the Energy Department would invest $37.5 million in the joint center to support research conducted at a facility in the U.S. and another in China. The United States, according to the Department of Energy, also is spending $3.4 billion to leverage $8 billion more in private investments to build a national array of plants that demonstrate CCS technology, and that showcase new combustion techniques. They include the $1 billion U.S. investment, just announced in September, for FutureGen, to build a high-tech oxygen equipped coal boiler unit to an existing 200-megawatt unit at an American Energy Resources plant in Meredosia, Illinois, and then deploy CCS technology to sequester the carbon emissions. The DOE also just approved a $308 million investment in a $2.8 billion Kern County, California plant to develop cleaner combustion technology and carbon sequestration techniques. Other investments include $350 million toward a $1.7 billion a state of the art integrated gasification combined cycle (IGCC) plant with carbon emissions directed to producing more oil in old wells in Texas, and $36 million for a $2.15 billion IGCC plant in Minnesota. Private IGCC plants are under development in Indiana and Pennsylvania as well, and the Duke Power plant in Indiana is testing CCS storage techniques. According to a recent study by the Brookings Institution U.S. and Chinese companies are collaborating on a number of projects. In August 2009, Duke Energy signed a memorandum of understanding with Huaneng for developing renewable and clean energy technologies. In September 2009, Southern Company and KBR Inc. agreed to license their IGCC technology to the Beijing Guoneng Yinghua Clean Energy Engineering Company. Peabody Coal is an investor in the GreenGen project. Huaneng joined the FutureGen Industrial Alliance. Here in Tianjin, the GreenGen project is at the head of a pack of Chinese power plants designed to burn coal more efficiently and to develop and prove CCS techniques. China has built over 20 supercritical and ultra-supercritical power plants that operate at extremely high water temperatures and pressures that produce much higher efficiencies, producing more power with less coal, and thus lower emissions per megawatt of power generated. According to the World Resources Institute, China has developed and approved seven major energy projects to demonstrate CCS techniques, and to develop more efficient energy generating practices. They include the 845-megawatt Huaneng Gaobeidian Co-Generation plant in Beijing, the first in China to fully test CO2 capture, and features a full suite of environmental controls. During winter months, steam from the plant is used for district heating, and efficiency can be has high as 84 percent. Engineers estimate the plant uses about 400,000 tons less coal annually than a similarly-sized conventional plant. GreenGen represents the next step in China’s drive for higher efficiency and lower pollution in generating power from coal. When the first of three phases opens next year, GreenGen will be the first utility-scale IGCC power plant in China, and one of the few operating in the world. 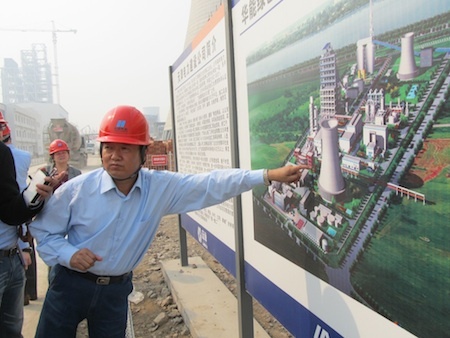 When fully operational in 2014, Chinese officials assert, Greengen will generate 650-megawatts at 60 percent to 80 percent efficiency – about twice the efficiency of conventional coal-fired power plants – and dispose of its climate-changing emissions through carbon capture and storage technology. If the plant is a success, said Jiang Kejun, a director of research for the Energy Research Institute, a unit of the National Development and Reform Commission, China is prepared to build 20 more such gasification and CCS power plants. “We want to make sure it works,” he said. We need more work and development on gasification in particular to make affordable small scale gasifiers to drive generators for fuel poor communities. Woah! I’m really digging the template/theme of this website. It’s simple, yet effective. A lot of times it’s challenging to get that “perfect balance” between superb usability and visual appeal. I must say you have done a excellent job with this. In addition, the blog loads extremely quick for me on Internet explorer. Outstanding Blog! Rattling nice design and excellent subject matter, hardly anything else we require : D.